Hibernian head coach Paul Heckingbottom watched his side leapfrog Hearts with a 2-1 victory at Tynecastle - and immediately targeted a late charge for Europe. Daryl Horgan notched a clinical brace to cancel out Peter Haring’s opener and send Hibs two points clear of the Jambos, having been 11 adrift of their city rivals when Heckingbottom succeeded Neil Lennon in mid-February. With six wins and two draws from his eight Premiership matches in charge, the Englishman is setting lofty goals as his side approach the post-split fixtures full of momentum. Heckingbottom said: “Is Europe a goal? Yes. But whether we get there or not, we’ll see. “We still have to play the teams around us and we’ll need results to go our way and continue this type of form to get there - but we’ll try. “The problem is that we have handicapped ourselves so much so it’s still a long way away. “When I arrived, I would have snapped your hand off to just say we got top six assured with a game left. It is a credit to the hard work and performances of the players that we are in the position that we are. Meanwhile, Hearts manager Craig Levein was left to rue his side’s profligacy as they slipped to a first defeat to Hibs in Gorgie since May 2013. 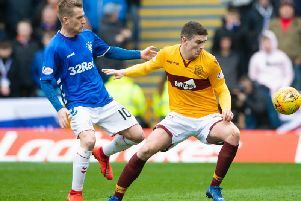 Levein said: “I was pleased with the performance overall. We just didn’t score the opportunities to put the game to bed. A thoroughly entertaining contest was marred by pyrotechnics being thrown on to the pitch on three occasions - from both sets of supporters - and, remarkably, a coconut appeared to be lobbed from the away section. “It is a nonsense,” blasted Levein. “It is the first time I have ever heard of a coconut being thrown on.